This is a super chunky large granny stitch blanket that I whipped up in no time. The yarn is that kind that goes thicker and thinner and the colours blended ever so gently into the next shade, creating a natural stripe in the blankie. I think the colours are like a rainbow but without the warm rainbow colours such as red, yellow, orange – just the cool colours of greens, blues, purples, pinks… my favourite section of the rainbow really. There is a chunky little bobble edge to finish the blanket and you can see how chunky the blanket is by the regular size tea cup & saucer beside it – quite chunky indeed. It’s a very large blanket taking up the whole of my large dining table. How I do love the classic granny stitch, especially for a blanket as it creates an airy kind of warmth… If that makes sense? I like the natural gentle organic stripe pattern this variegated yarn created too. I’m off to work my 2nd sock a little more now, and maybe do a little more on the chunky baby alpaca blanket I’m knitting at the moment too… tis hard to break away from that one as it’s soooooo soft and delicious to knit with. I’ve also still got my other knitted blanket I’m working on in between. Oh and all the other yarn in my craft room is just begging to be transformed… so much yarn, so many ideas, so little time! I hope you get to enjoy a few rainbows in your day. 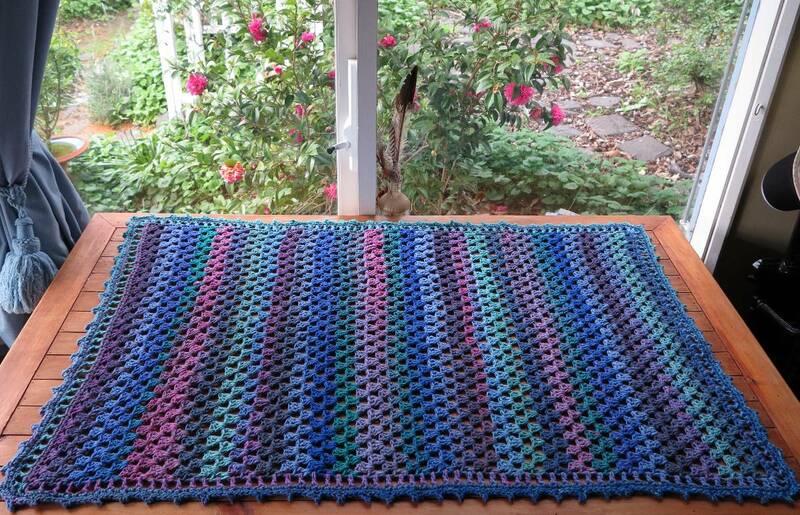 This entry was posted in crochet and tagged 100% pure wool, babies blanket, baby blanket, blankie, crochet, granny stitch, rainbow. Bookmark the permalink. 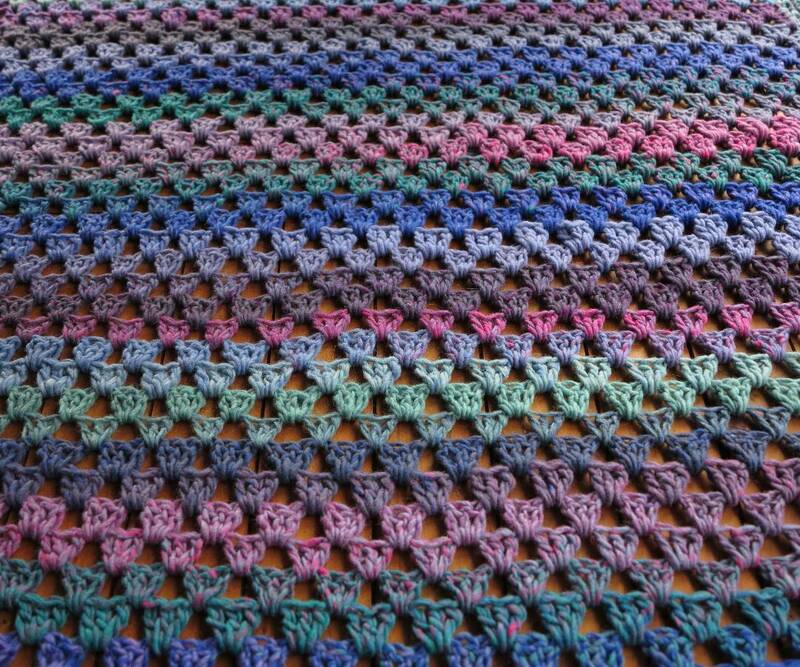 I’m so tempted to pick up me crochet hook and make one, but I’m halfway through a blanket and I want to finish it! I’m curious about the pattern for the edging…..I’m currently making a light grey/charcoal grey every other row with one only red row near one end, it’s so lovely and I want to make a pretty edging like yours….can you share the pattern for the edge? I think I found your blog via Pinterest, you know how you look and look and look on the internet and then you forget how you got from A to Z? Well that’s me….I forget actually, but I think I started on Pinterest, as I had put granny stitch in the search box and somehow through that I stumbled on your blog. Enjoyed the visit too! I can’t remember what I did on Cool Rainbow blanket edge but I’ll dig it out on the weekend and have a go at writing up what I did on the edge for you. Oh thank you so much…..do you dream in stitches? and projects? Gosh I do. 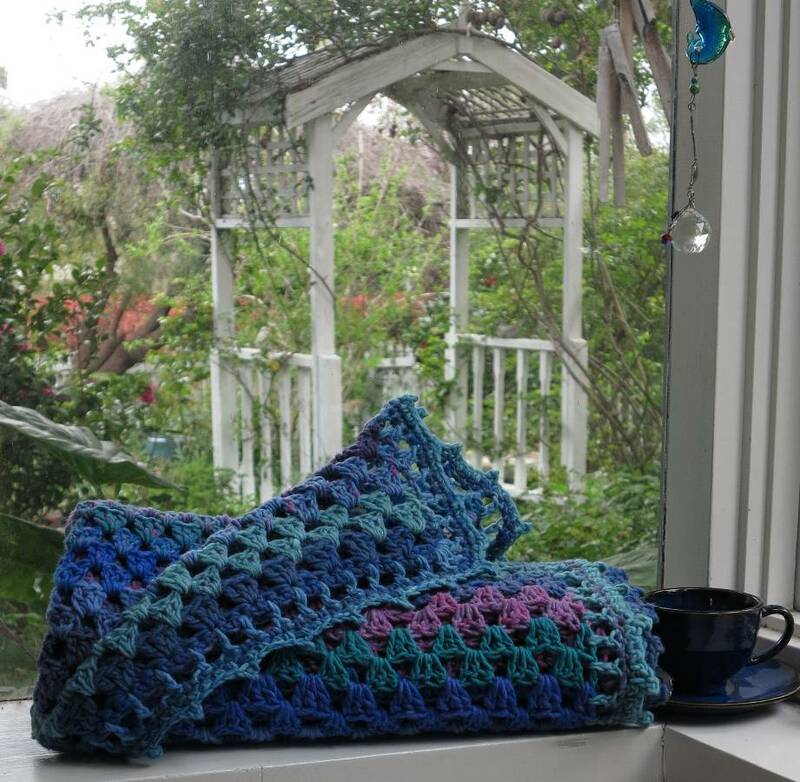 I woke this am with a lovely one in my head….it translates to large random “splotches” of pastel colors, irregular shapes and sizes done in the same stitch. I thought I must try to find something similar on the web and see what it looks like done up. I made a regular zig zag afghan for my great grandson, I did a couple of rows of single crochet all around the edge and then did popcorn stitches in each point, oh it turned out so pretty and so soft…the entire piece was a lime green and then I did a whole layette using the same colors. It made into such a pretty baby gift. I was so proud of myself. My oldest daughter (the grandmother in this case) and I both love crochet and quilting too. We will have dinner together this evening and sit and crochet together, both our hubbies will be working. We just love it. Wow Becky that’s amazing! I can’t say that I have dreamed up blankets in my sleep but I do ‘day-dream’ blanket creations and colours and patterns. It’s half the fun isn’t!? Your zig zag afghan for you grandson sounds lovely – I do love a nice lime green! I’ve written up a new post especially with you mind – it’s the cool rainbow blanket edge pattern. I hope you find it helpful.